This article was first published on 61-Bit. “You can get stuff done in a day up there. In Sydney it can take weeks,” says Graham Ross. The Kusaga Athletic founder believes it’s this enthusiastic attitude which allows direct conversations with government ministers – one of whom is usually in attendance at the numerous startup events throughout the city each week. It’s not only government providing funding to startups. Investment funds and accelerator programs are also contributing to the growth and viability of the region as a startup hub. The state is home to Australia’s only creative tech investment fund. QUT Creative Enterprise Australia (CRE), had its most recent demo day recently. Since 2013, there have been 30 companies across its accelerator and Startup Fund which have received investment, including Cardly, Trademark Vision and Audience Republic. To challenge the willingness of those operating in the ecosystem to help out, I messaged QUT CEA’s Entrepreneur in Residence, Alan Jones for comment. And sure enough, I got a reply within a couple of hours. After conceding he’s only been up there for a couple of months, he observed the comparatively reduced price of coworking and rental spaces. Adding “UberX is muuuch [sic] cheaper and faster than Sydney and Melbourne”. “There are plenty of places available on AirBnB at reasonable prices to allow a startup team or a founder to be flexible in their initial commitment to being based in Brisbane”. There are so many songs about New York, it’s impossible to walk the streets without humming at least one of the them – be it Jay-Z and Alicia Keys and their epic Empire State of Mind, LCD Soundsystem’s anti-love song or Interpol’s slightly darker still tale of spoilt New York Kids. We were back in the city again, a place which brings back special memories for our head of communications having proposed to his now wife there. This time though, it was World Blockchain Forum that enticed us back with promises of the new big thing in crypto. After all, it is where Ethereum and Dash were previously launched. 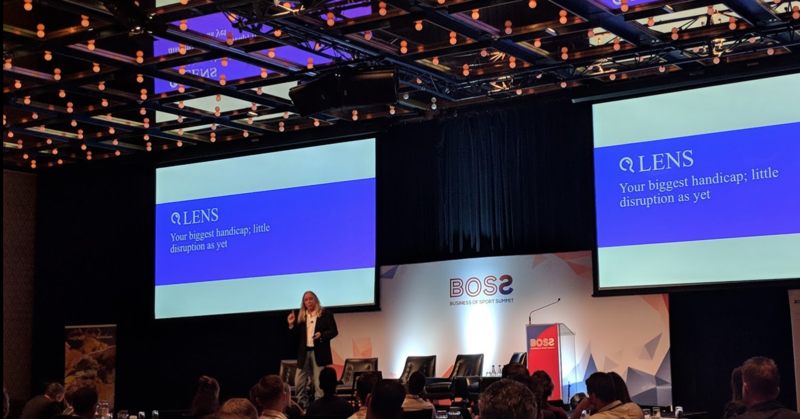 The main announcement this time round came from Beam, a retail blockchain platform to restructure how we think and go about buying products, read more on iTWire. Discussing securities and their future within the crypto space was CNBC Africa. And finally Bitcoin Centre founder Nick Spanos, gave a rousing speech about the potential of blockchain and the fact it doesn’t need to ask government permission, read more on BitsOnline. 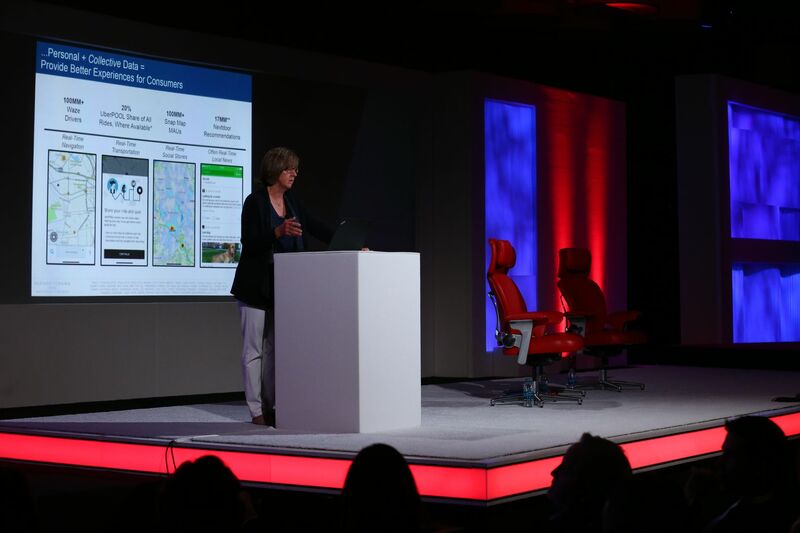 Silicon Valley and the world were eager to hear what the Mary Meeker report had to say last week – many regard the annual census as a litmus test for the tech industry, where ongoing trends are confirmed. Recode gives a pretty good summation of the report, along with all of the slides. Tech companies struggling with the ‘Privacy Paradox’ is one key theme, where the collection of personal data is taken under the assumption of improved tailored experiences. Commswork wonders whether a successful blockchain solution can return control of our data back to us as consumers? 2017 was the first year that the shipment of smartphones didn’t increase. 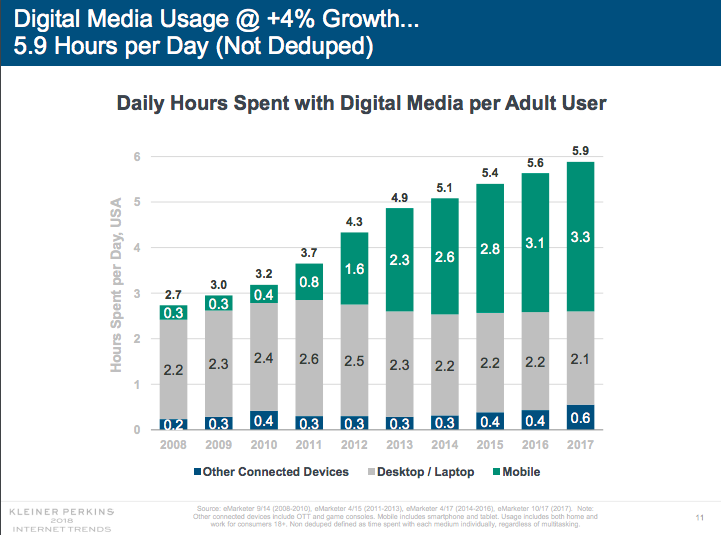 But the amount of time people spend online certainly did. TechCrunch does a handy job of distilling the news into a handy 20 slide deck. Slowing internet user growth continuing from the 2017 report. 2017 is the year of voice thanks to 95 per cent accuracy with the likes of Amazon’s Alexa. 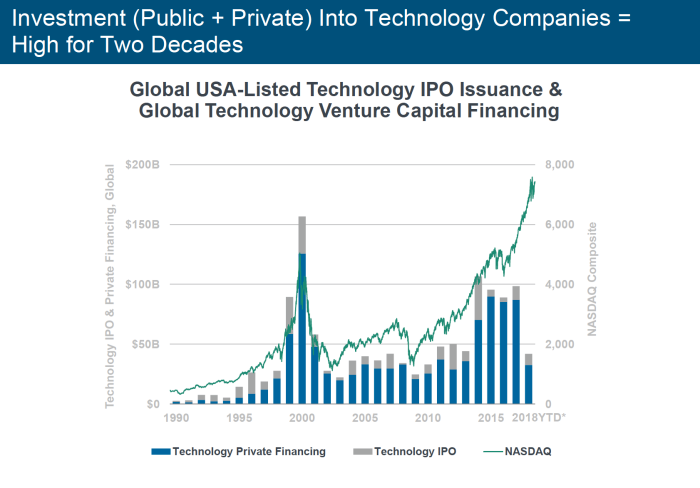 Public and private investment in tech companies is at a two decade high with the race to become the dominant player in emerging tech fronts of AI and automation. 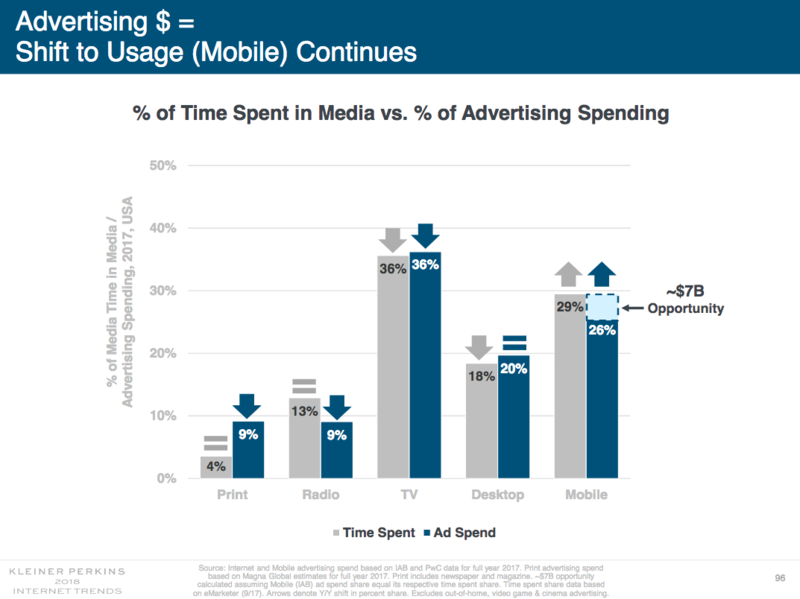 Offering a local view, Which-50, reduced its important slides down to just 10, focusing on the $7bn opportunity in mobile advertising (note this is down from $16bn last year with advertisers diverting budgets). Also noting the rise in importance of China on the global stage along with e-commerce within the country when compared with other western nations (well over 20 per cent of all retail sales are made online). 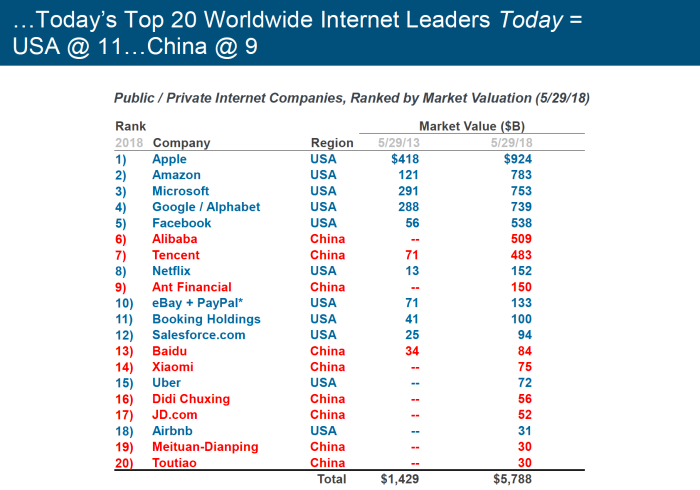 China now has nine of the most valuable tech companies, the US 11. Mark Zuckerberg should come out and apologise for Facebook’s role in the Cambridge Analytica scandal according to Commswork’s Liam Fitzpatrick. Speaking with Sky News recently, he went on to say that there will be more cases like this in the coming weeks and months – people download apps without reading the T&C’s but Facebook should still be playing a larger role in protecting users’ data to prevent it being harvested without consent. Change is coming. And it will be unforgiving to those who fail to prepare. That was the message from speakers outside of the world of sport speaking at the Business of Sport Summit earlier this week. 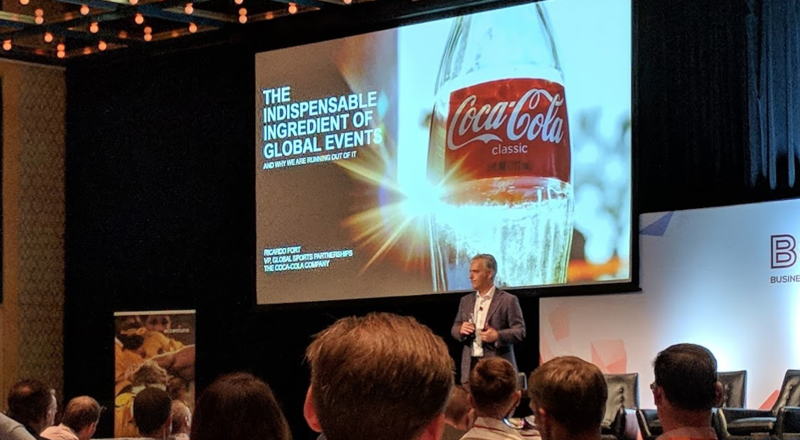 While the line-up did include the NRL Commissioner, FFA chief exec and AFL GM, it was the consultancies like Accenture, Showdown and Aussie pioneers Wearable X with the starkest message. Scott Dinsdale from Accenture warned about the influx of tech giants (Facebook/YouTube), which care not for traditions. Instead they just dispassionately amass content which can captivate their already scaled user-bases. 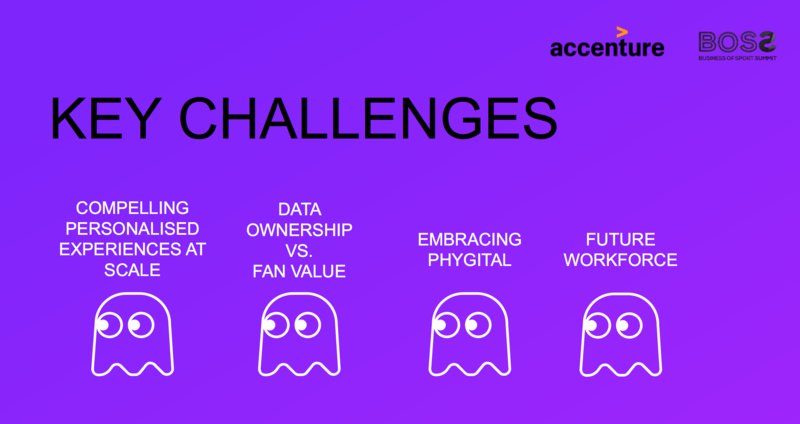 He likened sports’ position now to the music industry in the late 90’s – shifting to digital. It will look slow at first, as digital music sales did. In 2005, it still only represented just 2.5% of the market. But the swing was great and by 2010 that was up to 60%. Today physical sales have shrunk to 16% of the market losing over 80% of share in the space of 11 years. Dinsdale believes though, that this brings opportunity and ‘there’s never been a better time to be a leader in the industry’. He asks What would you do in digital today if you ignored what has happened up until this point? The best ideas are from those free of the ideas that have come before (the baggage of history). Revolution not evolution. He explained Metcalfe’s Law, that the value of a network is directly related to its size. The bigger the audience the more valuable any single piece of content becomes. It’s the connecting which becomes important not controlling the flow of information. Sport has a multi-platform opportunity. So for those already with a huge ‘social network’, like the Facebook’s of the world, the attraction of sport is obvious. The profit comes when there’s scale in revenue. Its potential for the platform is enormous and unquantifiable right now. Athlete turned business women, Angela Ruggiero admitted, “Yes, it’s a risk if (global sports brands) don’t (use technology),” the four time Olympic medalist, now CEO of Sports Innovation Lab said in a separate interview with SportTechie. Ricardo Fort, VP of Global Sports Partnerships gave a personal tale of how Brazil’s exit of World Cup 1982 etched into his memories along with an ad from that same year. His delivery was humourous and open. But the message that followed was very clear. 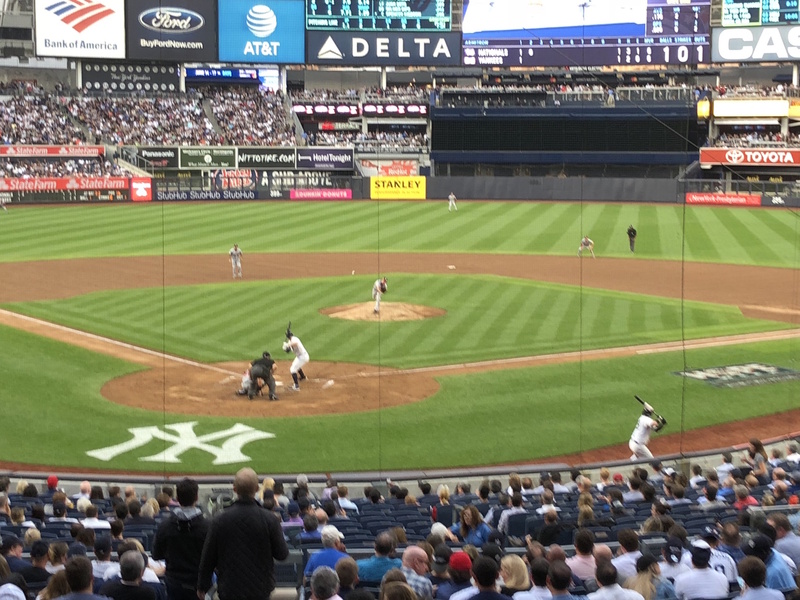 B2B sponsors will not provide the benefit for fans and ultimately will damage sport. Companies like Coca-Cola seek to add value in activations like its global World Cup trophy roadshow Fort said. However tech brands simply choose sport sponsorship as the cheapest approach for brand awareness. And without consumers as their target market, there’s no need to offer value for fans was his contention. Time to initiate a different mindset in your organisation by questioning the status quo and looking at how to benefit your audience. Fan insight has never been more valuable. Let me preface this article by saying I have worked with a number of ad tech vendors, doing some stellar work for clients. But despite having worked in the industry for the last seven years, there remain problems. Long argued issues of brand safety, measurement and an overall lack of transparency in the process of digital ad buying has followed the media narrative around programmatic for much of the last decade. Since 2011 we’ve seen articles like this one from Digiday on the ‘wild west’ of ad tech. But a year of acquisitions has narrowed the ad tech pool of players – and a noticeable shift to reposition as martech companies has been accompanied by increased conversations of education and adding demonstrable business value. 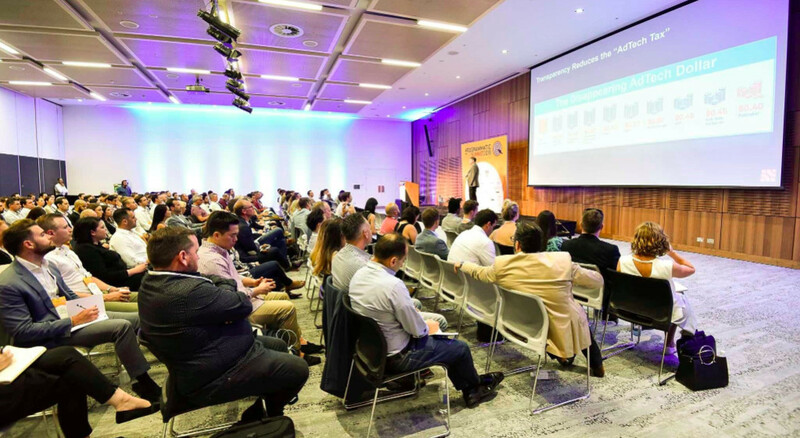 Well Sydney’s ICC played host to some of the industry’s foremost thinkers in the space at last week’s Ashton Programmatic Summit. To give a little context, it’s well worth, seeing the opening remarks from the IAB’s Vijay Solanki here. And for further insight on transparency issues, which were highlighted during the event, see Which-50 cover story from Andrew Birmingham in his post here. Uskovic went on to call out naysayers of ad tech, covered by Ad News, to which Mark Ritson has replied in the comments and points out the industry needs to address issues within the ‘murky’ (P&G’s Marc Pritchard’s wording) value chain. Infamously sceptical about the effectiveness of digital media, Ritson has dedicated his weekly column in The Aus to highlight the discrepancy in margins for media agencies between digital ad buys (typically 7-10 per cent across the duopoly of Facebook/Google) over traditional media (often just 3 per cent for TV, OOH, radio, etc). The debate is not going away any time soon as industry events will continue to build on the tension between the diametrically opposed Jason Pellegrino from Google and adjunct business professor Mark Ritson. Barcelona was the destination for most in the world of tech this week, as Mobile World Congress was in session. But most of the media was underwhelmed by the hardwares on offer. 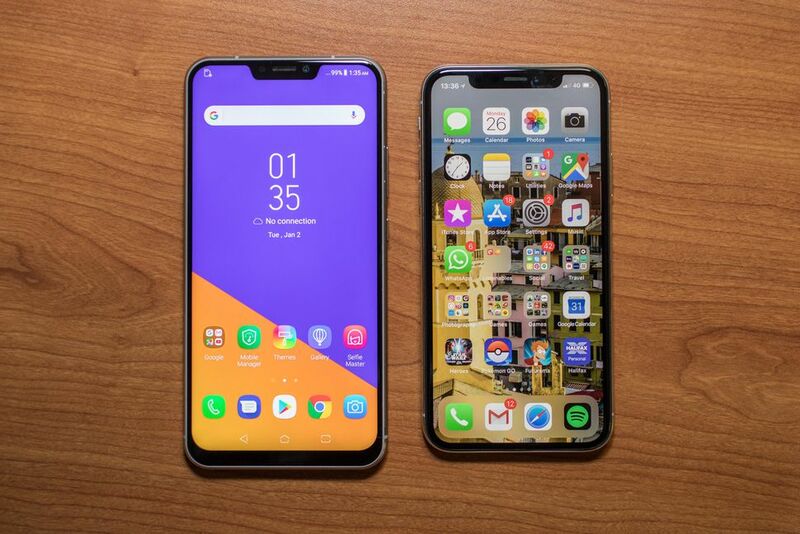 Indeed Fast Company reports that phone makers are embarrassing themselves by coping Apple’s ideas, as we move towards a future with features ubiquitous across devices. Following on, The Verge gives the best and worst from the event and explains why the future of mobile is more notches than headphone jacks. 5G was on the lips of most speakers though, as Chinese manufacturer Huawei announced a partnership with BT to bring the technology to customers in the UK, as ZDNet reports. 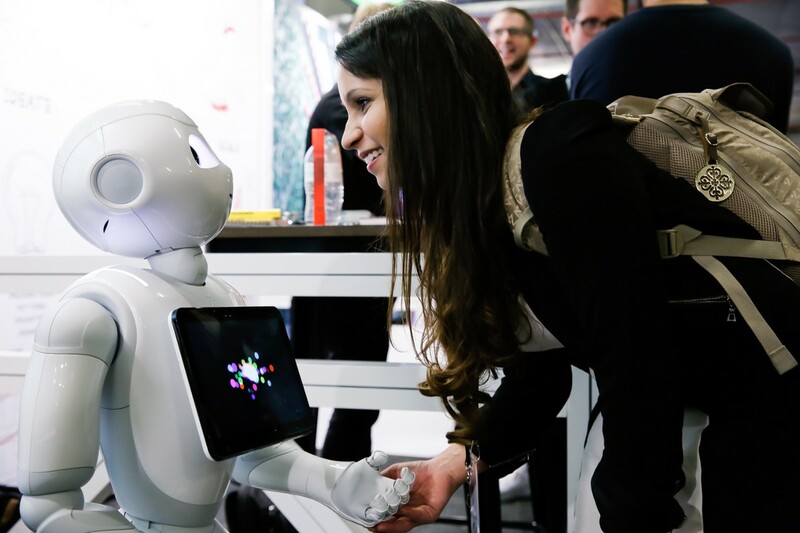 In a look to what comes after mobile, The Register weighs up options from this year’s event, mainly looking at the impact of AI. The annual tech and gadget pilgrimage to the desert took place last week. Drones, unnecessary connected devices among some pretty cool and innovative tech. 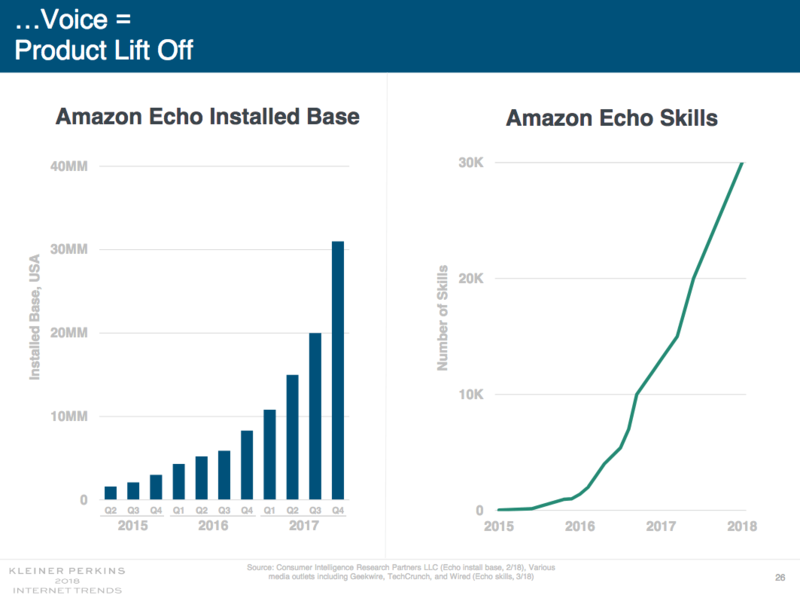 It’s the first year Google has set up shop at the event – billed as a VAS (voice activated services) battle of epic proportions as the Californian behemoth went up against Amazon which has been at the festival for many years through its cloud offerings. 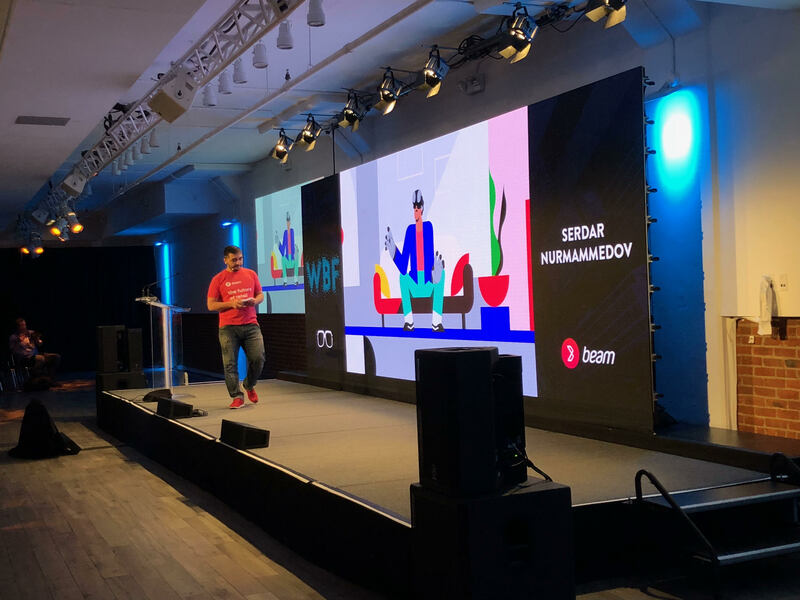 Sahil Patel explains more on Digiday. Despite a biblical downpour on the first day, Google’s pop-up demo tent received a visit from TechCrunch’s Tito Hamze and you can see what he experienced here. To read more on the Consumer Technology Association’s 2018 predictions, head to VentureBeat as Dean Takahashi reports from Las Vegas. 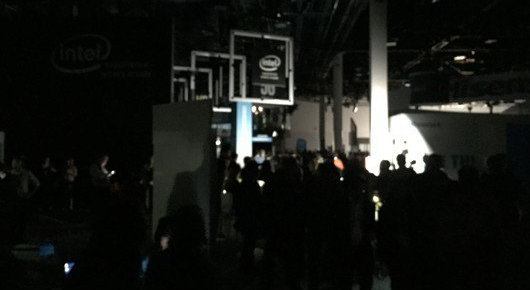 Oh and the lights went out. At an electronics festival. The irony was not lost on social media. Engadget with the update and the best Twitter could capture. Their credit cards were maxed out. They owed tens of thousands of dollars and needed publicity. So Brian Chesky and co-founders spent their last dollars on making political-themed cereal boxes around the Obama/McCain election. This PR stunt catapulted Airbnb into the mainstream. Silicon Valley is littered with serendipitous stories of investment — yet now the process is being democratised through technology. Blockchain is shifting access to capital. At its simplest, blockchain is a record of who owns what. It’s a digital ledger that underpins cryptocurrencies, like bitcoin, and is now being used by entrepreneurs to raise funds. In the first half of the year, Goldman Sachs found the pace of investments in initial coin offerings (ICOs) has for the first time overtaken traditional venture capital (VC) funding for early and seed stage. But why would an entrepreneur today choose this type of funding? There’s less rigorous pitching required. No Shark Tank style grillings from potential investors. Instead a more serene crowd-funding Kickstarter approach with tokens offered for those investing. The value of the token is dependent on its scarcity but also the demand for that currency, the more businesses that are built using the same blockchain, the higher the demand. And it’s quick too. Having an idea, taking it to market and letting the crowd decide, can be much faster than waiting for an Andreessen Horowitz to sign on the dotted line. However, traditional VC/accelerator routes do give access to networking, and mentors. So how do you successfully go about it? First, you need a good idea. You then have to plan how you’re going to get people interested. If you’re in infrastructure you’ll have some competition as 35 per cent of the 234 ICOs this year have been in that sector according to CoinSchedule. Will your coin be used as currency, only aiming to store value like bitcoin, litecoin or dash? Or will it become a platform, like Ethereum or NEO, where it will not only store value but also be a programmable currency that powers a blockchain’s unique function? Or even a subcategory of platform know as “product coins” like Golem and Sia, where the coins are used to access one thing that blockchain specifically offers. Once that’s decided, you’ll need to set up the back-end for your denominated coins to be distributed to investors and managed on exchanges where they can be freely traded. Smart Contracts cut out the middlemen. They allow all of the ­financial aspects of an investment, to be coded and run automatically. Ethereum has lowered the barrier to entry by providing a platform that enables anyone to develop their own coin without having to implement their own blockchain. Often you don’t need a minimum viable product or prototype, with founders opting for a white paper to outline their vision and what investors can expect. Many point to the lack of regulation and protection for would-be investors — no formal “equity” is given, leading to commentators referring to it as the “wild west” of investment. Scams are commonplace. But stricter regulation is coming. China’s recent ban for start-ups choosing this route will ultimately pave the way for a more robust industry. 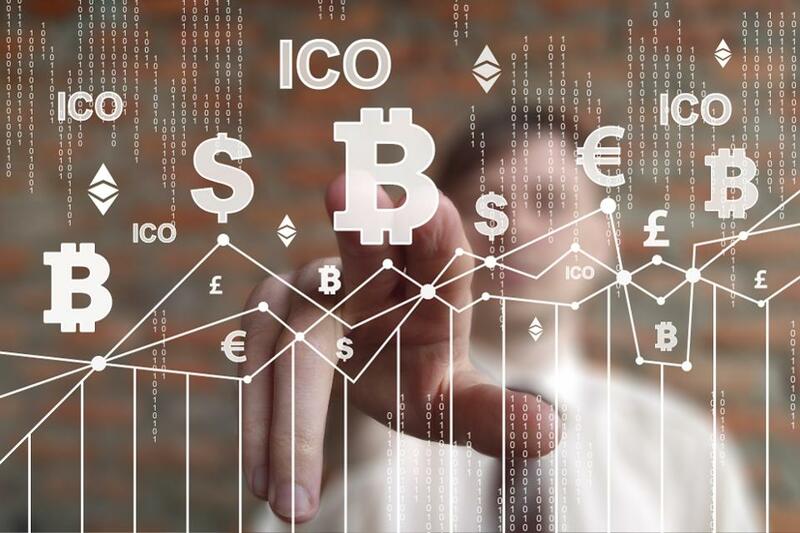 To ensure both you and your investors are protected, it’s worth seeking legal counsel on the technical set-up of your ICO. Will Apple’s ARKit help augmented reality reach mainstream audiences? AR. A technology that’s been around for decades. But last summer’s Pokemon Go craze provided a new stage. It placed AR in the hands of people who had never heard the term. Overnight fame. However I can’t help feeling the limelight hasn’t quite been capitalised on. This could change in the coming weeks. I’m not a developer. Which is why I sought advice from three minds much more expert than myself to ask what impact they thought, ARKit could have on the adoption of the technology. Well back in June, at Apple’s annual week long geekout, also known as WWDC (worldwide developers’ conference), it confirmed a new “fast and stable motion tracking” SDK for iOS11. Essentially the building blocks for apps that allow objects to look real when using the technology on your phone or tablet. Since then developers have had a chance to play with this toolkit and the results seem stunning. So from an entertainment point of view you can see the benefit. Previously AR has needed triggers to launch the experience. For example Fox Sports Bathurst 1000 race last year allowed viewers to beam the race direct to their coffee table thanks to studio Mod, a Sydney based agency headed by Michela Ledwidge. However both ARKit, and Google’s recently announced competitor ARCore, strip out that need. Just point and go. No longer do you need a QR code-like mapping point to get the technology started. Co-founder of Sydney’s women in AR/VR group, Ledwidge believes “AR is a great opportunity, if you have the assets”. Both Apple and Google now think the time is right for pooling resources into the tech. Google has come out with its jumpstart for developers, ahead of its second handset launch Pixel 2 on October 6. However one of the accusations has been that AR, looks impressive, but lacks real world use. A gimmick. Speaking with Chris Panzetta, head of creative tech agency S1T2, he’s measured in his excitement about the upcoming updates as he believes we have a way to go before it’s taken beyond just a novelty. “What ARKit and ARCore are going to do is democratise the technology”. He says that we’ll need to forget about the technology first, to then realise its full potential and what it could be used for. He hopes the way we reference it will change, much in the same way the term digital is now slowly becoming obsolete (you no longer need a digital strategy, but a strategy for a digital world – as argued by Tom Goodwin years ago). Looking to take the tech beyond ‘fad’ status, the new Neon AR app, made with ARKit, has put together possibly my favourite problem-solving use case. It overlays a neon sign above your friends in a crowd. Imagine the benefit at festivals. Hopefully coming to Australia in time for Falls fest. There’s a lot still holding back the tech. Battery life, processing power, not to mention the social issues around mixed reality and someone wearing a headset that could potentially be filming you (not something that has held Air New Zealand back mind you). The backlash against ‘Glassholes’ still lingers in the memory. Although it’s interesting to see that technology get a recent rebirth in the business enterprise sector. And perhaps that’s where the potential for AR exists too. Construction and floor plans brought to life for architects. Agricultural planning with real-time data on a headset. This mixed reality future already exists and is helping the thriving agritech scene. A showroom with no cars? Well GM is already taking the showroom to you. Rob Lang, CEO of AR outfit Auggd has seen these differing sectors reflected in his clientbase. Just last week the company released this fantastic experience for Hyundai, giving car buyers extra info, like difficult to explain animated safety features, customisable colours and versions of its vehicles. All of the people I spoke to were quick to say that it’s great to have their technology potentially in the hands of more consumers. And more importantly developers. But you still need a good idea at the centre. S1T2’s Panzetta claims “if it doesn’t require a super mega brand for it” to work, then it might be worth pursuing. “We’re only at the start of a technology here, that’s been around for 20 to 30 years” according to Rob Lang from Auggd. It’s going to be up to the developers and those in the industry to prove its value. So while AR may not be catapulted to top of our tech habits with this update, analyst firm Telyste thinks it will be enough for Apple to regain its crown as number one phone maker in Australia for the first time since 2014.